If you don't qualify to receive a Federal PELL Grant from the government don't worry; grants aren't your only option to receive financial aid. Scholarships are just as great, and sometimes better, than grants; it all depends on the type of scholarship for which you qualify. There are so many different types of scholarships available it's almost ridiculous. Contrary to popular thinking, scholarships are not just for the incredibly smart, or the supremely gifted athlete. 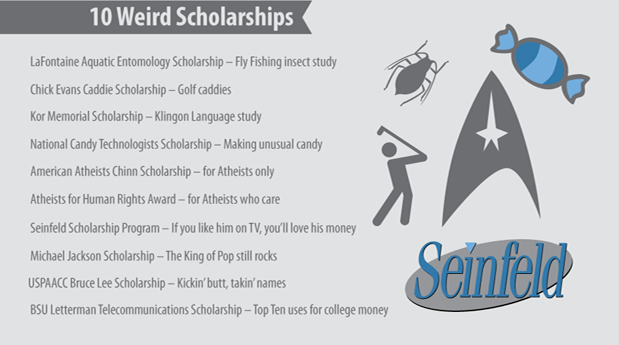 There are scholarships for just about anything. Are you really tall? There's a scholarship for that. Are you really short? Yup, that too. Are you left handed? Yeah, even that. Do you really like candy?! Even that! You can get $5,000 for being interested in candy! Think of all the scholarships you could be missing out on just for thinking they are only for smart kids. Now let's not discriminate against the smart kids, they get their scholarships too. Scholarships with the purpose of rewarding hard-working students normally have the most money to offer. So the fact that you could get a 'candy' scholarship should not deter you from working hard in school to receive the best scholarships. Each university, including most online universities, will have a prestigious scholarship that is awarded to the best students that will most likely cover all expenses incurred while attending school, so shoot for that one if you can. If you don't think you're the smartest kid at your university that's not a problem. Many universities have school-specific scholarships for different specifications at the university. For example: if you are a biology major, your university's College of Science will probably have a scholarship just for biology students; so push yourself for that. There is never an excuse to not try to get a scholarship! This is the main key in getting financial aid through scholarships. You have to APPLY! Many scholarship applications are pretty straight-forward: fill out your personal and financial information, then explain in an essay why the organization's money would be well spent on your education. That's it! Each scholarship has different requirements and qualifications, so make sure you meet them before applying. Keep an eye on application deadlines for scholarships because they all have different cut-off points. Most of them need to be completed early in the calendar year so keep that in mind. Scholarships don't work like grants. There are often scholarships that have requirements that you need to meet as a student or member of an organization to maintain your eligibility for that financial aid. Don't think that just because you got your money you're in the clear. Make sure that you know what eligibility requirements there are for your scholarships so you don't get caught off guard. To be eligible to receive a scholarship you have to be enrolled full time in an accredited university. Go figure, right? Just make sure that the scholarships for which you apply are accepted by your university. Enrollment advisers at online universities can be very helpful when navigating this maze. Speak with one today and get enrolled in school!